Kyle's entire life has been plagued by demons. It has cost him his family and almost his sanity. When he finally meet the reverend, Kyle learns for the first time that he may be able to fight back. The reverend has been at this work for years, counting on his faith in God to see him true. Even as Kyle and the reverend attempt to come up with a plan of action, the devil clearly has ideas of his own. If I had only one word to describe this volume it would be SLOW. Oh my goodness, does Kirkman ever know how to drag out a plot. It begins with Megan, Kyle's sister taking a trip into town to meet Kyle's ex wife Allison. Megan and Allison meet in a coffee shop and after some small talk get to the heart of the matter, despite what Allison has been through, a part of her still misses Kyle. Allison knows that Megan is the one who keeps giving Kyle cell phones which he uses to call her but she finds these silent calls comforting. Megan believes that Kyle not only beat her but their child and yet she is comforted that she is being stalked? Women recovering from being in an abusive relationship have very conflicted feelings. It makes sense to me that Allison would miss the good times that she shared with Kyle; however, having her find comfort in being stalked is beyond problematic. This is a man she believes put her in the hospital and nearly killed their child. It's one thing to reminisce about good times and another to find comfort in what should be understood as predatory stalking. Allison later finds an upset Kyle hiding in her bushes. She doesn't call the police, she doesn't scream, and instead, she invites him to wait while she puts their daughter to bed. They talk about the fact that Allison believes that not only did Kyle ruin their marriage but that he gave her no warning that he had this kind of dark side. For his part, a crying Kyle protests that he is trying to get to the bottom of what happened. The two then kiss before Allison excuses herself to call Megan to take Kyle away. It takes Amber (Kyle and Allison's daughter) sneaking onto the porch to see her father for Allison to finally flip out. Funny how Allison wasn't concerned with Kyle creepily staring at Amber from the bushes but Amber actually seeing her father is enough to set Allison off. A small tug of war ensues over the child and Amber reveals that it was Allison who attacked and not in fact her father. The only one who leaves the exchange feeling better is Kyle. He absolutely takes responsibility for what happened though he didn't in fact beat his wife and child. Still something about hugging Amber calmed his anxieties and he promises Megan not to go near his wife and child again until he has a solution. Still, though we know that Kyle is innocent this dynamic does not read well at all. Women really aren't faring well in Outcast thus far. To some degree they all fall into the role of victim and though they don't know it yet, it's apparent that they are going to be dependent upon Kyle to save them. It's particularly troubling that all of the women, save Kyle's young niece have become possessed or had some act of violence aimed at them. In this episode, we have Megan, Kyle's sister and the only one who really cares about him become possessed by a demon. We already know what when possessed, Allison attacked both Kyle and Amber. There is also Kyle's mother who became possessed by a demon and abused Kyle, who is now in a coma. The reverend and Kyle seem to have the buddy thing going while the women are relegated to the status of victim. Kyle's partner in demon hunting is the reverend Anderson and like Kyle, he has paid a huge price, having also lost his family. Like Kyle, Anderson is having some doubts. I guess a little thing like having the devil show up and carve up your chest will do that. The reverend's pain magnifies when he learns that several of the people he though he had excised were in fact still infected by demons. Kyle however cuts to the chase and brings up all the people who are currently infected that they don't even know about. In between all of the angst, we learn that Kyle is in fact the Outcast though Kirkman and Azaceta don't go into detail as to what this actually means. We also learn that as much as the demons despise Kyle, they want his light because it gives them strength. This is why they do the succubus kiss thing with him whenever they get they chance. The devil of course sees Kyle as his. The demons and the devil are clearly working towards something but at this point we have no idea what it is. This is the crux of the problem with Outcast thus far. 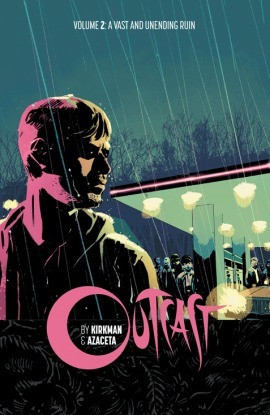 Rather than feeling like it's dropping little nuggets which are leading somewhere, Outcast seems to be dragging its heels and it fails to get to the point. There's not much about Outcast that's original or even compelling at this point.